Maria Constantinou is a London based interior designer, working alongside Eris Koulsoudakis, heading the team of Meraki Design. 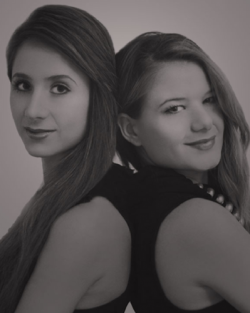 As the name of the practice implies, Maria and Eris choose to pour their heart and soul into every project they undertake. From concept to realisation, Meraki Design provide professional purchasing, project management, on-site installation services, and develop interior design concepts. Did you always know that you wanted to be an interior designer, and how did you get started in the industry? I was actually very lost as a teenager as to what I wanted to become. I remember always wanting to be in the creative industry, but at 18 I felt that I wasn’t ready to make a decision that would define my life, so I set out to study business, which was a good foundation, I then went onto study Interior Design as a second degree. By the time I finished my studies, I was very mature and ready for the industry. I started off working for a consortium of IHG hotels from which I acquired vast industry knowledge at a very fast pace. Describe your interior style, what sets you apart from other designers? I think our interior style is heavily influenced by the project, its context and the research that comes from it. As a company, we don’t believe in cookie cutter design, and really take a fresh approach with each project. We believe in a strong fundamental concept that is inspired by the client , context of the project and history of the property. As designers, we build a story and try to thread that through into the scheme. We are, however, inclined to more contemporary lines and believe simplicity and uniformity is key. We enjoy using natural finishes and fabrics that have a timeless flair making our project relevant in years to come. Artisans of Devizes works with a portfolio of interior designers, looking to provide bespoke, personalised interiors. Talk us through a recent residential project in the UK, and tell us what makes this project unique. We are working with Artisans on a very unique property in London. It boasts seven bedrooms, a yoga room, a sauna, a library, two formal lounges, and an eighty metre squared kitchen. Not to mention a twelve-seater dining room, which has hidden wine fridges behind the walls, and a cosy forty-five square metre family room, which overlooks a heated swimming pool with an automatic cover. There is also a tennis court on the grounds and facilities to cater for events outside. I think the size of this house makes it very unique for London standards. 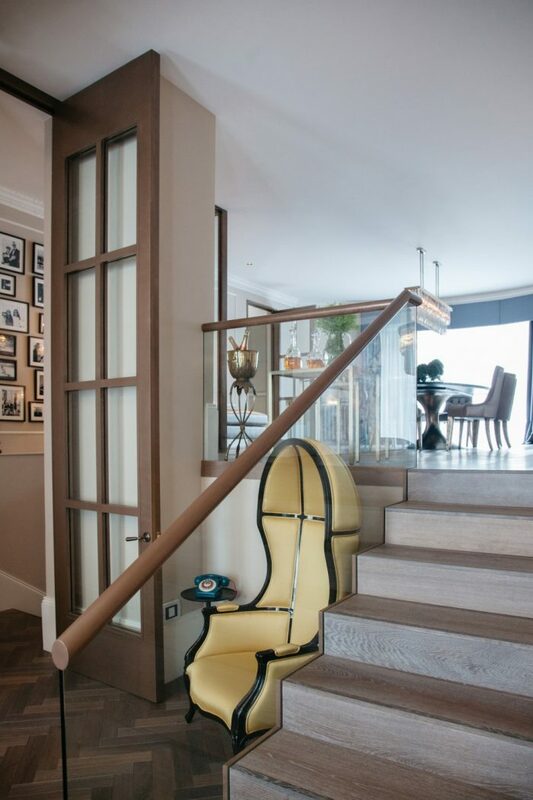 Located in London, we transformed the apartment from something quite dated to a contemporary abode, while being sympathetic towards the property’s architecture. When the apartment was converted, a fire lobby was added. You can clearly see the distinction between the original architecture and the new extension. The beautiful cornice, which decorates the room, stops where the fire lobby adjoins. A stunning, contemporary glass balustrade, seamlessly links the mezzanine level to the lounge area. To enhance the high ceilings, we wanted to add 4.4 metre high, bronze sash door. There was a challenge in obtaining the door, as we needed to make sure it was fire treated and that it would fit within our budget. We were able to work with a local tradesman and overcome our challenge. Tell a designer something is impossible, and watch miracles happen! We wanted to link the old with new, with detailing and furniture, adding the client’s personality into the space. In this case, we had to express a young girl’s love for eclectic fashion and glamour. The space needed that one piece of furniture that stands out, having a conversation piece in the home. In the stairwell we designed a feature wall gallery of photographs, with personal pictures of the client. Filters were chosen for the images to ensure they were all of the same colour tone. We painted all the architectural features the same colour, especially the cornice, to make the space feel more uniform and less fussy. We also used the cornice as a curtain pelmet. Pendants do not need to be in the centre of the room, especially when there is a height restriction. Monochrome isn’t dull, it can be warmed up by adding natural wooden tones. Off-beat furniture such as this petrified wood piece and cabinets in the bathroom. The importance of context and research is key to interior design, this is what makes every project unique. For a recent hotel project, we enhanced the interiors by adding charm and character. Because the hotel was an old manor house, we thought it would be fun to invent a persona for the property, who collected beautiful things that had a reference to the area.We emphasised the history of the building by restoring all the period features. Through creating our persona, we found archived photographs. Looking through the photographs, we took design inspiration and added features that had once been removed. For example, original chandeliers were hung back in place. Due to the property’s coastal location, the interior colour scheme was a mixture of serene blues and sandy neutrals. The colours and nautical references on the gallery wall help draw the eye to the outside view. For one of the bathrooms in the manor house, we characterised a feeling of luxury, which felt welcoming with an escapist quality. 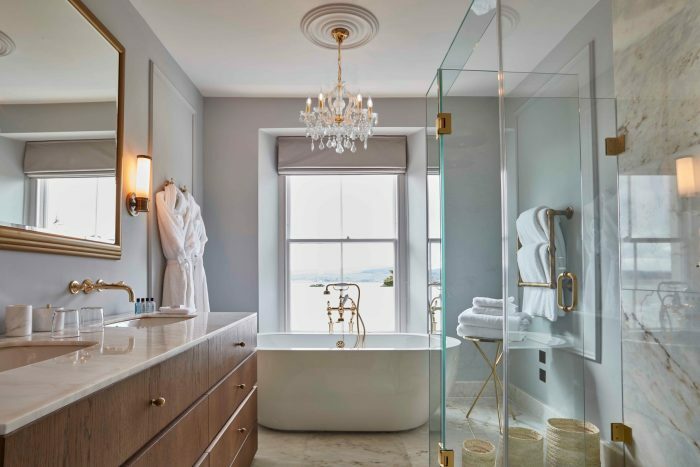 A freestanding bath in a bathroom adorned with a white marble floor that has flickering hues of gold and grey. We added a few mouldings to the walls recollecting the history of the building. There is a small table next to the bath for champagne, and his and hers vanity unit for that added feel of luxury. There is also a large walk-in shower with gold plated traditional styled brassware from St James. The toilet is separated in a different place with its own door for privacy.